Dosage of 1 Kg/1 m³ water system with PVC or HDPM. Dosage of 2 Kg/1 m³ water in concrete pools system. Dosage of 4 Kg/1 m³ water system in swimming pools. The treatment is applied once every 14 days. The best results are obtained if the media, in this case zeolites sorted with the size of 0.6 -0.8 mm and concentration of Clinoptilolite to 87%, is pre-inoculate with bacterial consortium. This was achieved through zeolites immersion in bioreactors with inoculate for several weeks in controlled environment. Zeolites was previously formatted through washing with a solution of Hydrochloric Acid. After washing and drying at 400 degrees Celsius, are treated with a sodium chloride brine at a pH of 12 with NaCl. At the moment is produced specialisation of zeolites via sodium-ion doping in order to have high selectivity relative to ammonium ions and neutral over other ions such as calcium, magnesium, etc… Zeolites retention capacity can reach to be 30 mg NH4/1 gram zeolites. This retention capacity is finite and will arrive at the passivation in very short time. To counter this passivation is bacterial consortium after it was pre-innoculate amazing develops a specific area until 24,000 m2/m3. Zeolites Bio-Zen sprinkle onto bottom of tanks and ponds in a uniform way possible. Does not harm humans, animals, fish and aquatic organisms. Normalize the ammonia level instant. Do not use Bio-Zen before you are sure that you have a minimum level of 0.1-0.3 mg/l NH4 in water. Do not use Bio-Zen when NH4 level exceed 1.4 mg/litre. Do not use Bio-Zen when the pH level is not between 7.0 to 8.5. Do not use Bio-Zen in the system if the oxygen level is not at minimum at 90% saturation. Do not use Bio-Zen in the system if you do not have a minimum of 50 mg/l of CaCO3 and a minimum of 30 mg/l MgCO3 or if water hardness is below 3 points (German). 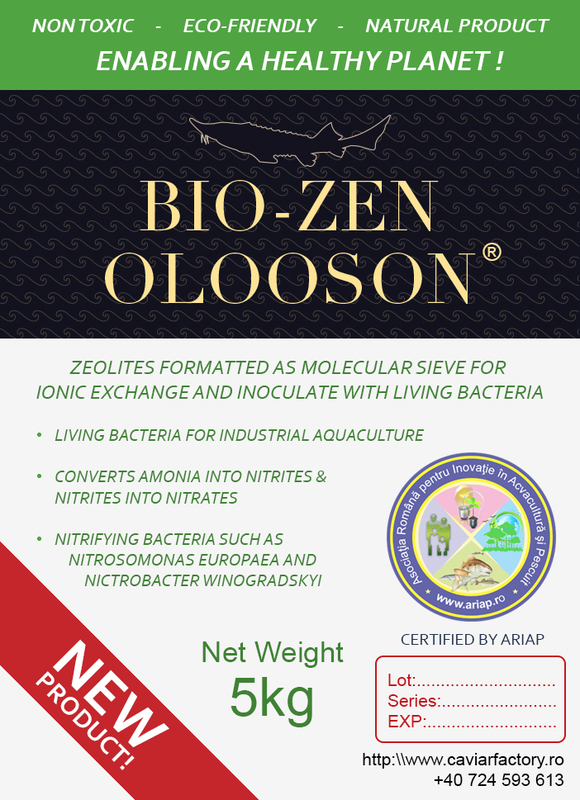 Do not use Bio-Zen in the system until you have ensured that the level of vital nutrients identified a minimum level of Cu, Zn, Mo, Fe, P, K.
Do not use Bio-Zen if you used, or use antibiotics of any kind and in any quantity.